Take the Number 7 Subway to Main St Flushing station, then the Q15 (Beechhurst) bus to Clintonville St/Cross Island Parkway stop. You can also use the express bus QM2, operated by MTA Bus Company, which travels between Bay Terrance and Midtown Manhattan through Linden Hill and Whitestone/Flushing. The bus stop “Cross Island Pkwy and Clintonville St” is a minute away from the church. Take I-80 east to the Cross Bronx Expressway (95) north. Stay right on to Exit 6A (Bronx Whitestone Bridge). Cross Whitestone Bridge in the left lane and exit to the Cross Island Parkway south. Turn right on to exit 35 (14th Ave, Francis Lewis Blvd). DO NOT TURN at the traffic light. Stay straight on the service road, passing 2 traffic lights (149th and 150th streets). Turn left at the next traffic light onto Clintonville St. The Church is one block up, on the right. Take the Long Island Expressway (LIE, Rt 495) or Grand Central Parkway west. Exit right to Cross Island Parkway and follow towards Throgs Neck Bridge north. After Throgs Neck Bridge exit, bear right onto exit 34 (Utopia Parkway). Turn left at end of exit, go one short block, and turn right onto Cross Island Parkway service road. Turn right at the traffic light after the shopping plaza onto Clintonville St.
Take the Brooklyn-Queens Expressway (278) to the Grand Central Parkway east to the Whitestone Expressway (678) north. Take the Whitestone Expressway north, exit left onto the Cross Island Parkway south, and turn right onto exit 35 (14th Ave, Francis Lewis Blvd). DO NOT TURN at the traffic light. Go straight on the service road past 2 traffic lights (149th and 150th Sts). Turn left at the next traffic light (Clintonville St). The Church is one block up, on the right. St. Nicholas Church was founded in 1916 as a parish of the North American Missionary Archdiocese of the Russian Orthodox Church. The original wooden church was built in 1919 and was in use for nearly 50 years until its replacement in 1968 with the present building. 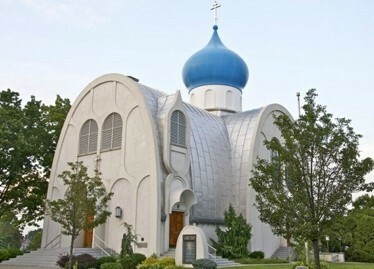 Whereas the founding members of the parish were almost exclusively of Russian, Galician, Carpatho-Russian, and Ukrainian origin, today St Nicholas parish provides the place of worship and spiritual care for people of various ethnic and cultural backgrounds: Russian, Ukrainian, Greek, Italian, Belorussian, American, Romanian, Georgian, Latin American, etc., who were either raised Orthodox, came to Orthodox Christianity after years of spiritual search, or converted from other denominations. The parish is a member of the Washington - New York Diocese of the Orthodox Church in America (OCA). We welcome anyone who lives in or visits the New York City area to come and worship with us and then join us for coffee hour after the service. Please refer to other pages of the website for additional information.